Few things kill a conversation, a kiss or a cuddle more than bad breath (known as halitosis in medical circles). And yet, there are just so many mouth fresheners you can swish or gums you can chew before your mouth becomes dry and cottony, and your taste buds commit suicide. Not to mention the fact that these breath freshening quick fixes are temporary and seem to let you down at just that most crucial moment. Right? The only way to deal with chronic bad breath is to look for a more permanent, long term solution. And since none of us want to add more chemicals to our bodies, this easy, make-it-at-home Ayurvedic recipe is worth a shot. It definitely worked for me. For added benefit, add a bit of this powder to your toothpaste every time you brush your teeth! Black sesame seeds are little powerhouses of calcium, which is good for gum and teeth health. Plus, they also help slough off bad breath causing plaque, while helping build tooth enamel. Fennel seeds not only help in the secretion of saliva (bye bye dry mouth! ), they also bust the bacteria that give breath that nasty smell. 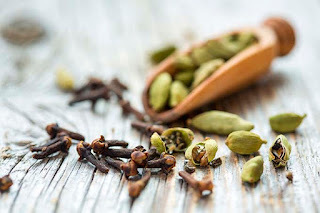 Ditto for cloves. Cardamom is another antibacterial and it comes with the added benefit of a strong, sweet and fresh aroma that immediately works to counter the compounds that cause bad breath. Finally, nutmegs round off the mix, with their plaque-sloughing and bacteria-defeating abilities. Because, in this case, you can’t get rid of the problem fast enough!